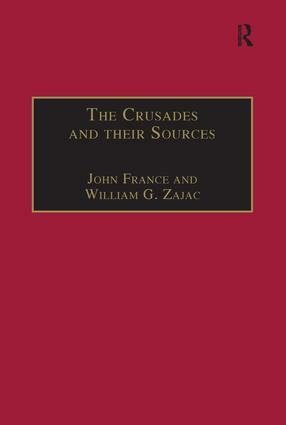 This volume is concerned with the sources for the study of the Crusades, conceived in terms of the records of their history and of their enemies, the motives that inspired them, and the monuments which they left behind. Some of the studies analyse particular historical sources, both written and visual, for the events of the Crusades and the history of the Crusader states. Others look more broadly at the impact of the Crusading movement in the West, its origins and its propaganda, from the First Crusade to the time of Erasmus. Contents: Preface; Bibliography of books and articles by Bernard Hamilton 1961-1997; Raymond IV of St Gilles, Achard of Arles and the conquest of Lebanon, Jonathan Riley-Smith; Frontier warfare in the Latin Kingdom of Jerusalem: the campaign of Jacob’s Ford 1178-79, Malcolm Barber; Albert of Aachen and the Chansons de Geste, Susan B. Edgington; The Anonymous Gesta Francorum and the Historia Francorum qui ceperunt Iherusalem of Raymond of Aguilers and the Historia de Hierosolymitano itinere of Peter Tudebode: an analysis of the textual relationship between primary sources for the First Crusade, John France; Usamah ibn Munqidh: an Arab-Syrian gentleman at the time of the Crusades reconsidered, Robert Irwin; Les colophons de manuscrits arméniens comme sources pour l’histoire des Croisades, Gerard Dédéyan; TheTractatus de locis et statu sancte terre ierosolimitane, Benjamin Z. Kedar; The Hospitallers’ early written records, Anthony Luttrell; Ehe und Besitz im Jerusalem der Kreuzfahrer, Hans Eberhard Mayer; The Livre des Assises by John of Jaffa: the development and transmission of the text, Peter W. Edbury; Les évÃªques de Chypre et la Chambre apostolique: un arrÃªt de compte de 1369, Jean Richard; Picturing the crusades: the uses of visual propaganda, c.1095-1250, Colin Morris; ’Mighty against the enemies of Christ’; the relic of the True Cross and the armies of the Kingdom of Jerusalem, Alan V. Murray; The south transept faÃ§ade of the church of the Holy Sepulchre in Jerusalem: an aspect of ’Rebuilding Zion’, Jaroslav Folda; A necessary evil? Erasmus, the Crusade, and war against the Turks, Norman Housley; Index.